Airbrushing Molotow Pen Refill Liquid? I read about the good quality of the Molotow pens, I intend to buy some but I noticed you can refil the pens and they recomend the liquid for airbrush use as well. Wondering if anyone has tried this? Yep, and it works great. No need for an undercoat either. Works on raw plastic and over paint. 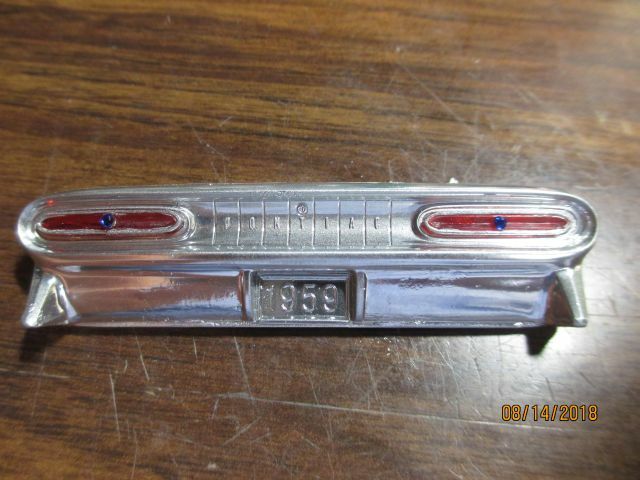 Here's a picture of the rear bumper for a 59 Pontiac that I restored. That bumper looks excellent! Did you have to thin the Molotow? If so, what did you use for thinner? No thinner, just straight out of the refill bottle and into the air brush. I didn't use any undercoat either. You'll have to adjust the air pressure to your liking. I used a low pressure, about 10 to 15 lbs to spray. 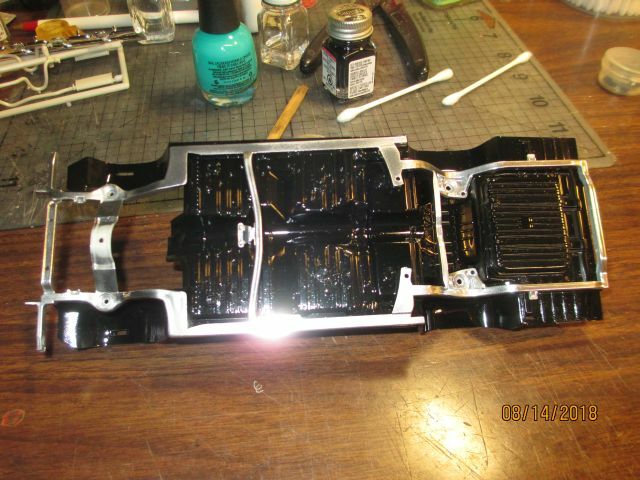 Here is another picture of the frame painted with the Ink setting on the floor pan of the Pontiac. Thanks for that. Looks good. Did it take long to Dry? I messaged the site selling it and they said it can take a week to dry. I did a full article in the April 2018 issue of Scale Auto comparing Molotow chrome vs. Alclad and Spaz Stix. Moltow takes awhile to dry; the longer you let it dry, the better. It's best shot wet and unthinned through your airbrush. It can be protected with Spaz Stix ultimate clear, also shot wet and unthinned (and humidity can be a factor). You should wait at least 2 days before applying the clear. Mist coats don't work well with either the Molotow chrome nor the clear. Test it on a plastic spoon or something other than something like a unique model part before doing a permanent application so you know how it "feels" when you shoot it. I love the stuff, have had great results. It's so much better and easier than doing Alclad/Spaz Stix chrome in impossibly thin coats over black or other color basecoats. Molotow is extremely pigment-dense, it covers anything, it sprays like paint. Spraying wet gives it a liquid chrome mylar effect. If you let it dry for a long time, it's much more resistant to handling. So you're the guy that wrote that article. Now I have the opportunity to thank you personally for providing that information. The only question I had was what pressure did you spray it at but you just answered that here. I've been using this stuff along with the Spaz Stix Clear and it works PERFECT!! Again............thank a million ZZ. Just a silly question...what do you use to clean the aibrush? Thanks for the info ZoomZoom. I get mixed resuts with Alclad and not having to base coat would be good. I must admit though, I use a Dual action airbrush and try to control the pressure rather than adjust my compressor which could be my Alclad issue. Thanks for the tips though. I can see use on my 1:1 classic car inerior as well. OldTallDad It's Alchol based ink and i read that rubbing alcohol and acetone nail polish used to clean up alcohol based inks so i assume you could use one of those. I myself not having used it but i paint with enamels would use enamel thinners to clean. Bit of a pain airbrush cleaning. I generally blast through some compatable thinner, followed by cellulose thinner and then proper airbrush cleaner after using paints. Alclad and AK have their own thinners, but not sure about Molotow as it is classified as an ink. Would probably go the cellulose thinner route as this stuff seems to shift anything in my airbrush, followed by a dedicated airbrush cleaner. Molotow sprays well through my Grex setup at 15-20 psi. Both lacquer thinner and acetone have worked fine for cleaning the airbrush. I have yet to find anything that properly thins the Molotow; what some others have said worked I found did not, the thinner just separates from the chrome ink. It doesn't need thinning...spray it wet. It covers very well. So much easier than dealing with Alclad. Great i love paint ready to spray. Just discovered my locale hobby shop has the ink and pens in stock which is great. Think i'll definetley give this a try.